Is it possible to fix a hole in the drum skin? 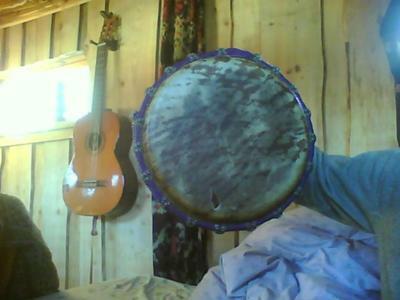 An edged object fell on my drum, and now it has a ½ inch hole in the skin. The flab of skin is still hanging there, so i wonder if i could just glue it back on? Even with the hole in it, the drum sounds fine to me, so the only reason i want to fix it, is so that it won't spread and make more damage. Of course, with a hole of this size, it would be better to replace the drum head. But since it is a small drum, you can definitely try to fix it before spending money on a new skin. Africans do it all the time. 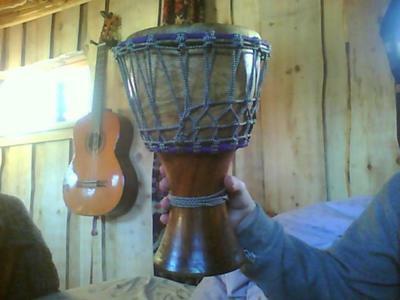 The stem of your djembe looks too narrow to reach inside the drum with your hand. Maybe a child could help you by pressing a piece of cartboard against the hole from the interior of the drum. Or insert an object that does that. In any case, you need to find a way to stabilize the flab of skin from the inside while you are working and while the glue is drying. Then, use a very fine sand paper to roughen the skin around the hole just a little bit. A nice amount of skin dust should accumulate without causing further damage to the hide. Apply clear super glue to the crack and then cover it with the dust. Press it on. This mix of glue and skin dust will create an artificial scar. When it is dry, you can use the sandpaper again to even it out a little bit. Mensah fixed lots of holes this way, but it doesn't work every time. If the scar rips again, patch it from the inside with hot glue and fabric (Africans use goat skin) and repeat the process. But be aware that this probably affects the sound. If none of this works, you can still decide the replace the skin. I wish you success!